By assessing the future crop yield early in the season, it is possible to identify areas of the field that lack certain nutrients. Lack of nutrients delays the plants' growth and reduces the potential final yield. Hence, it is very important that the plants have sufficient nutrients available through the growth season. By identifying the location of plants that are not growing at the expected rate, and have a lower Leaf Area Index than expected, the farmer can decide which areas of the field should receive particular attention in terms of the application of fertilisers. The same is true concerning the need for pesticides. Weeds can have very different spectral signature, compared with the crop and remote sensing can be used to identify their location. It is quite common for the weeds to be scattered in the field. On the other hand, pests like fungi and bacteria, tend to appear at the edge of the field and slowly spread throughout the field. 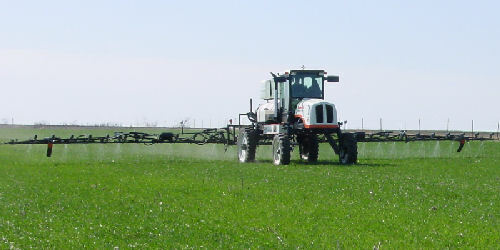 Adjustment of ultra-low volume herbicide applicators. 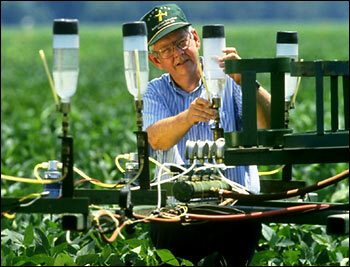 With this method the use of chemicals in agriculture is greatly reduced. 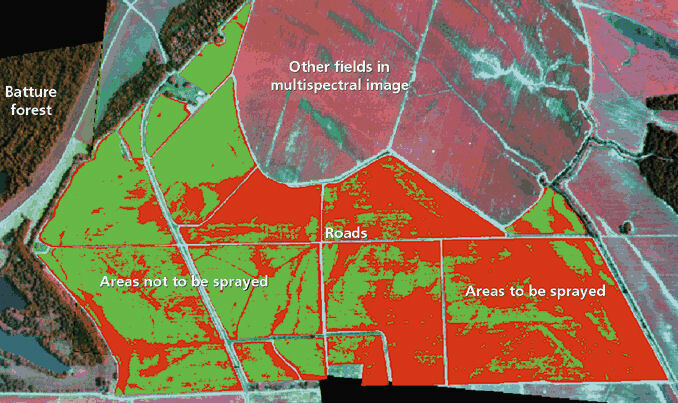 By using remote sensing and GPS, it is possible to identify the exact location where the application of fertilisers or pesticides is required. The Variable Rate Treatment (VRT) is a system that regulates the rate of pesticides or fertilisers, releasing only the required amount over the	areas or the field that are in need of the chemicals. Many of the pesticides and fertilisers that enter the field, are transferred to other areas through evaporation, surface leeching or seeping in the ground and get transferred with underground water. 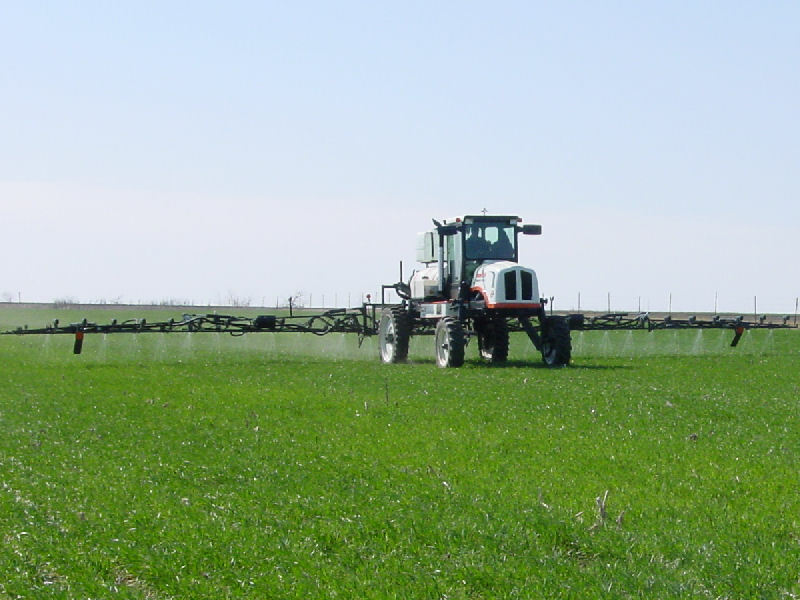 The use of VRT greatly reduces the amount of chemicals that are applied in the field. This leads to lower cost for the farmer, since smaller	quantities are required, and also has a reduced effect to the environment. In addition to pesticides and fertilisers, water is becoming a very valuable commodity, as good quality water is becoming less and less available around the world. Saving on water with the use of variable-rate treatments, is already important and will become even more significant in the years to come. Mapping of Mississippi River delta, identifying the most probable areas where insects might attack. On the image above, we can see that sensors mounted on a combine can provide a map of the field, where the areas requiring treatment are identified. The areas of the field can be classified in many classes, depending on the value of the vegetation index that is derived from the remotely sensed data. 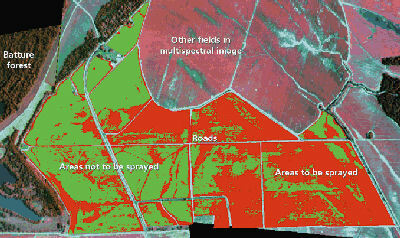 In this case a threshold value of the vegetation index is selected and the field areas are separated in two classes, those that require and those that do not require spraying. Even though the remote sensing data can show us which areas of the field contain plants that do not grow as well as they should, it is not always apparent what the actual cause of the problem is, from the remote sensing data alone. They do, however, serve the purpose of drawing the attention of the farmer to the particular part of the field, and the experienced farmer can then decide whether the problem is lack of nutrients, water or interference of weeds and pests. Tractors equipped with sensors and GPS devices can collect spectral data and they associated geographic coordinates, with high spatial accuracy. This information combined with variable-rate applicators, can ensure that only the least required amount of chemicals are used and only at the areas of the field that actually need them. This means that less money is spent on chemicals by the farmer, and more importantly, less chemicals enter the agricultural environment.